A Madison Night Mystery series is a fun, cozy series that I am very much enjoying. I have not read the whole series but will go back and catch up. You do not need to read them all to enjoy this book as much as I did. There is enough of Madison’s history included in the story to get to know this lover of mid-century modern design to go with her vintage clothing. In this outing, Madison Night has teamed up with Jane Strong for the Very Important Projects competition sponsored by the Design in Dallas Initiative. On the final day for entries to be submitted, Madison is shocked when she receives an email from Jane canceling their partnership. Madison rushes to the Republic Tower where DIDI has their offices to talk to Jane, but Jane has already submitted her proposal. Madison has five hours to come up with a new submission. She is able to cobble together her entry and after turning it in, she heads off the ladies’ restroom. What she does not expect to find is Jane sick in the washroom. While Madison rushes off to get help for Jane, she dies from blunt force trauma. Of course, Jane is at the top of the list when it comes to suspects. 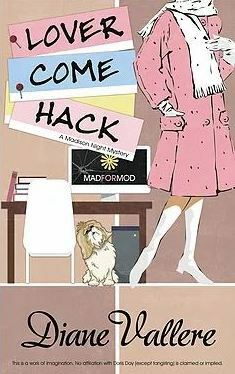 Throw in some major computer hacking, a virus running wild all over town and Madison having to turn to her frenemy, Donna Nast for help, and you have a fast paced story. Lover Come Hack is an entertaining cozy mystery. Madison is a smart, independent woman who usually knows what she wants and can think on her feet in a crisis. I love a protagonist who isn’t pushy, invasive, nor idiotic enough to do stupid things that put her in danger. With the computer issues, Donna Nast is an integral character in this story and I actually liked her quite a bit more than in other books. As far as the mystery goes, it was complex with many twists and red herrings. Madison juggles sleuthing, trying to figure out who killed Jane, and working on her design entry. Madison has a unique voice and it comes through in this series. We experience life through Madison’s eyes and some of her comments are amusing. This is where the humour comes in with this series. I recommend this series to anyone who enjoys a cozy with a unique setting and backdrop. If you can, start at the beginning, but if not, I jumped in part way and am very much enjoying this series. The publisher, Henery Press, generously provided me with a copy of this book to read. The rating, ideas and opinions shared are my own. About the Book (From Goodreads): Retro Reboot! About the Author: I grew up reading both Trixie Belden mysteries and Vogue magazine and learned how to spot a counterfeiting ring and accessorize a wardrobe. Now I use that knowledge to dream up plots for the Samantha Kidd, Madison Night, Material Witness, and Costume Shop mystery series. I still love accessories, only now some of them are accessories to murder. I like the sound of this one, Carla! Thank you for a cracking review. Lovely review, Carla. I love humor in my cozies and this sounds super fun. Henery Press is publishing so many fun titles. Wonderful review! Yes they are. They are one publisher that I always watch for. Too bad they jumped to Edelweiss. I still need to look at Edelweiss more. I’ve used it some, but it seems overly complicated compared to NetGalley. The more I use it, the easier it is. The thing I like about it is you give a reason for requesting a book, so I can plead my case it it is a book I really want to read and review. Yes! That’s definitely the best feature. ” I love a protagonist who isn’t pushy, invasive, nor idiotic enough to do stupid things that put her in danger.” – I am so with you on this! This book sounds like so much fun. I really don’t read nearly enough cozy mysteries. You nailed it on this review, Carla! This was my first in the series, and I enjoyed it enough to go pick up a few more on Amazon. Of course that “spare reading time” hasn’t happened yet, but it nice to know they are there. It’s kind of like having a load a firewood in for the winter. I have so much spare firewood, I will never get cold. 😂 I have read three in this series and enjoyed them all.